Mainly in Shanwei, eastern Guangdong province. Haifeng dialect, Lufeng dialect or Hailufeng dialect is a variety of Chinese mostly spoken in Shanwei, Haifeng County, and Lufeng, Guangdong, China. 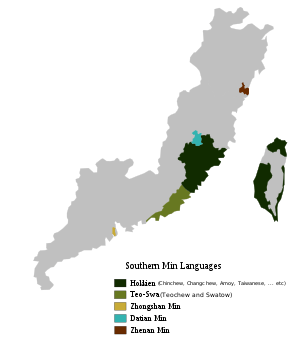 It classified as a variety of Southern Min and sometimes as a variety of Teochew dialect. Since some of the pronunciations of Chinese characters in Haifeng dialect are different from those in Teochew dialect because of different rimes in both dialects, Haifeng is sometimes considered to be independent of Teochew.